On its 140th anniversary of the first hearings, the Supreme Court of Canada has joined Twitter, popular social networking service that enables users to send and read short 140-character “tweets". 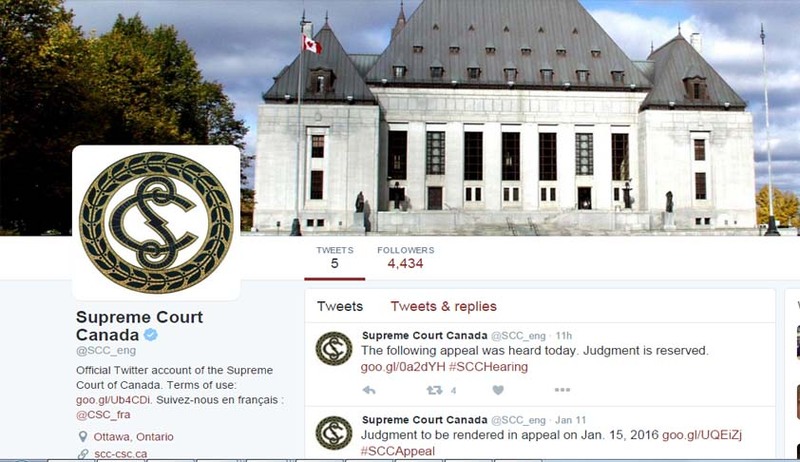 Now the Supreme Court can be followed in twitter as @SCC_eng. Press Release issued by the Supreme Court on Monday says that Tweets will pertain to the business of the Court and will be posted from two Twitter accounts, one in English and other in French. The Chief Justice of the Apex Court of Canada said “Communicating on Twitter forms part of the Court’s commitment to open and accessible justice. Sharing information about the Court’s work is crucial to its mandate, and Twitter is a useful tool in achieving this objective”. The first Tweet on January 11th, 2016 reads “140 characters or less for the 140th anniversary of the SCC’s first hearings“. The account has become fully operational as it is tweeting day today happenings in the Court. It has got around 4300 followers as of now. Supreme Court of United Kingdom had joined Twitter in 2011 itself and has around 1.75 Lakh followers. There seems to be no official account of US Supreme Court on twitter, but Supreme Court of many states of US have.